Tents and sleeping bags, campfires and marshmallows… and rock and roll all night, and parties ev-er-y day!!! 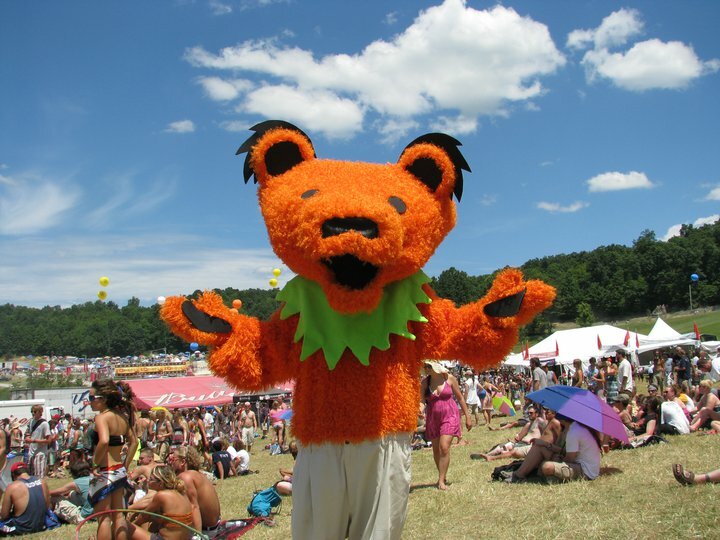 Do you love music festivals? Did settling down with a spouse and kids and a mortgage meant that you had to give it up? ‘Cause that’s not really the case. You can do it! 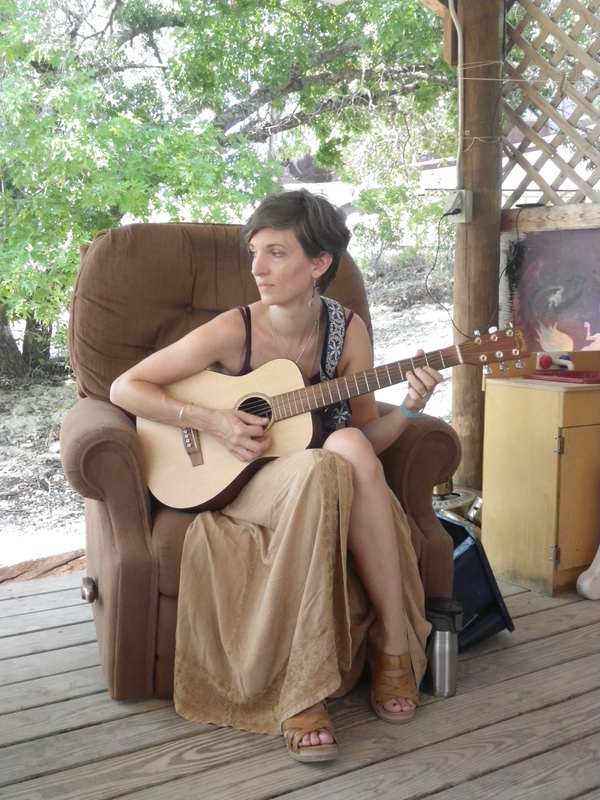 Ms. Kat at “Camp Good Tarp Layer,” Kerrville, TX 2013. 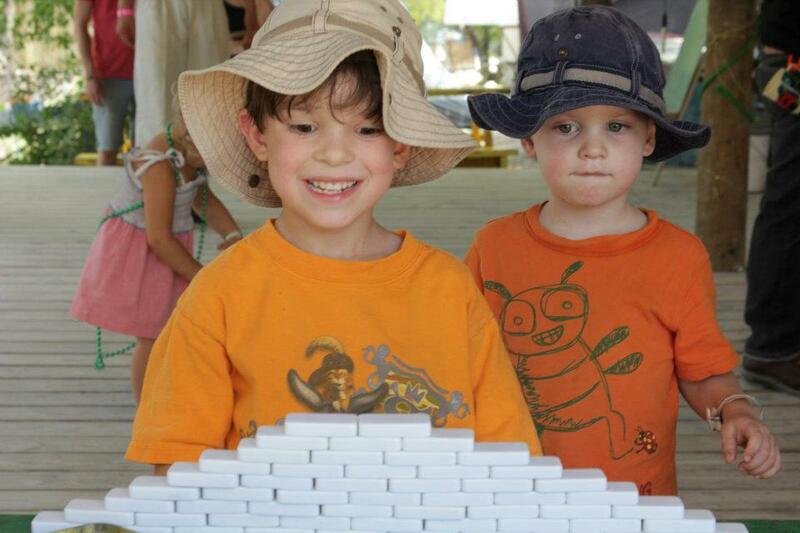 Kerrville’s family-friendly folk festival — with camping — is happening right now! Kerrville Folk Festival — May 21st – June 7th, Quiet Valley Ranch, between Kerrville, TX and Medina, TX. About 2 hours west of Austin, just 30 minutes beyond Fredericksburg — a great, MELLOW scene for families, with three weeks of dates to pick and choose from. Be SURE to check out the hilarious Trout Fishing In America, the legendary Peter Yarrow, and the incredible Cherokee storyteller Gayle Ross. And that’s just ONE weekend’s “great for kids” recommendation! Check out the rest of the festival schedule and lineup HERE. 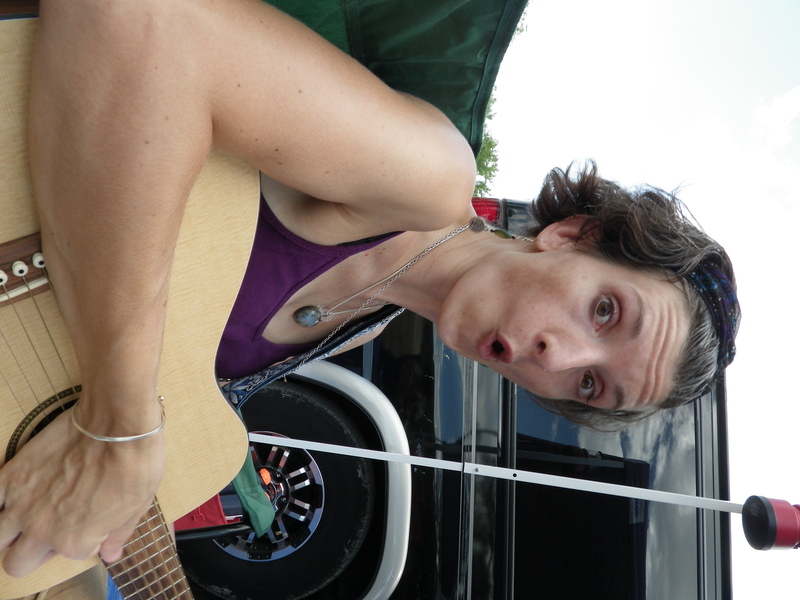 Photo taken by my then-5-year-old, All Good Music Festival 2011, Masontown, West Virginia. 1.) Throw the rules out the window. Okay, not all the rules. But for a few days, you can survive without a bedtime, without eating breakfast at breakfast-time, lunch at lunch-time, and dinner at dinner-time. You CAN have ice cream every afternoon. You CAN talk to strangers. You CAN go feral, and run around barefoot with a watergun. You can stay up late and catch fireflies, and get up at dawn to see the sunrise. You can take a nap in the tent in the middle of the afternoon! Ice Cream Every Day! And Nerf blasters?!? 2.) Be Patient. Be Friendly. Be Kind. Be Considerate. You’re out of your element. So is everyone else. For a few days, you’ve elected to create a small city of like-minded people who all have the same goal. 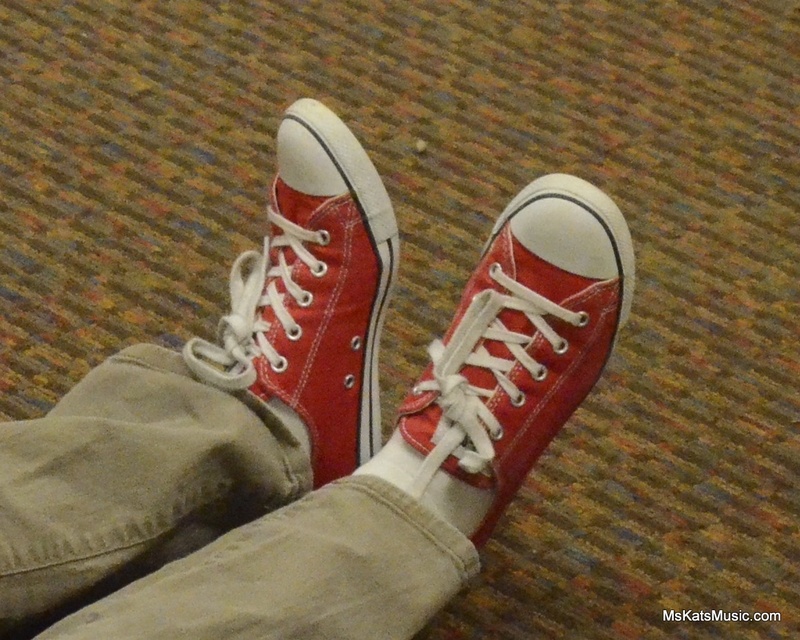 To relax and enjoy themselves within the festival’s mini-society. And children are an ever-present part of society! 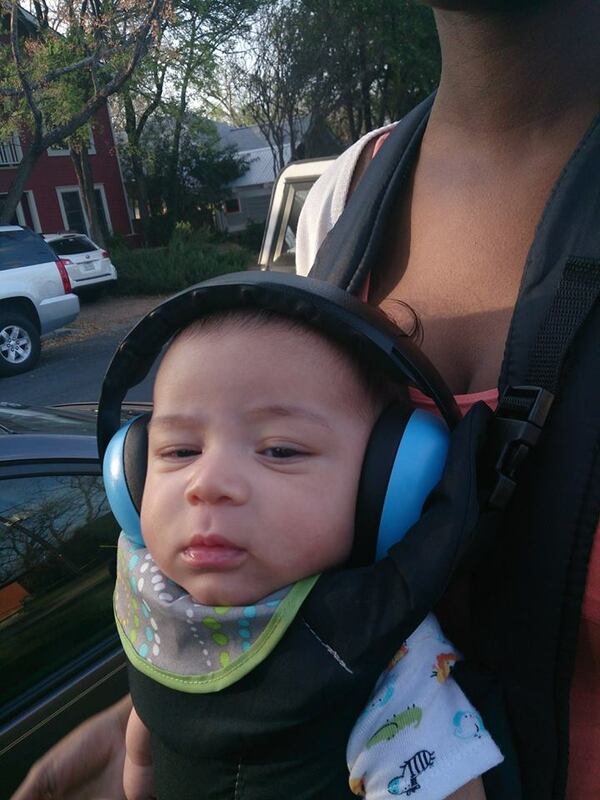 No music-lover is ever going to be upset that you’re exposing your children to music. No one will think that you’re an irresponsible parent because *maybe* some other festival-goers choose to party a little harder than is prudent — you’re going to take care of your children, and keep them just as safe as in your own home (and you’re not going to BE “that guy.” Right?) And in return, if your child is getting disruptive to the point of irritating other festival-goers, you’re going to remove them from the situation until they can pull it together again! Simple as that. 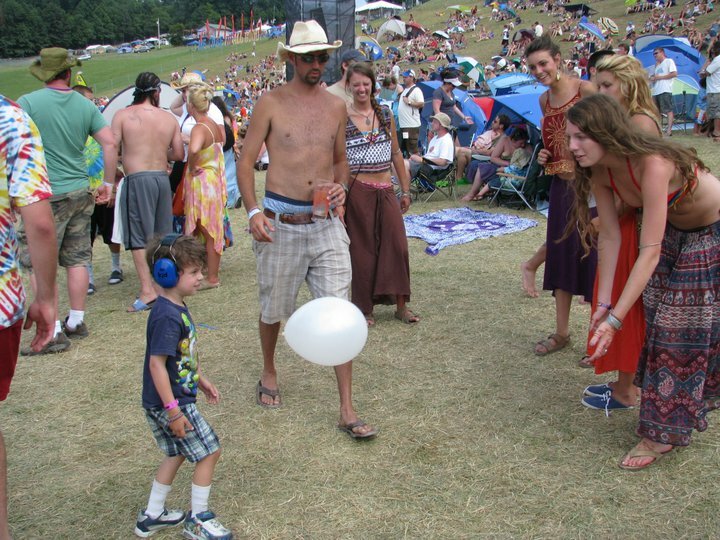 Sweet strangers thought it was SO novel and fun to have a kid to play balloon-bop with! 3.) Look for Family Camping. First of all, go to a family-friendly festival. 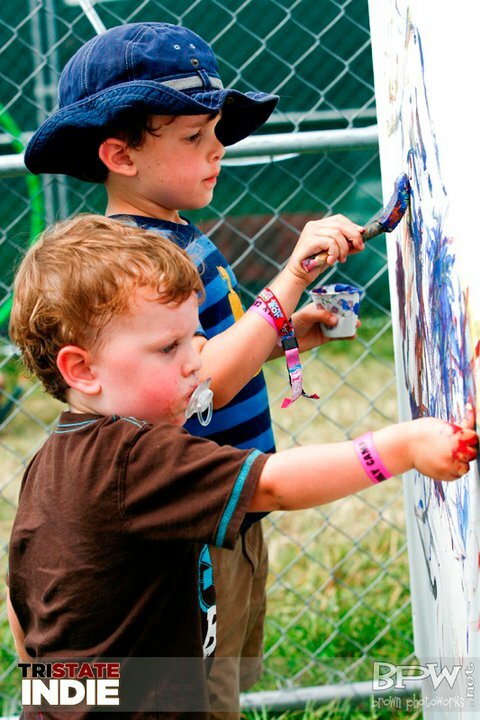 Bonnaroo, or Lollapalooza, or other “rager party festies” are probably not good choices for young children. Find a festival that advertises Family Camping. 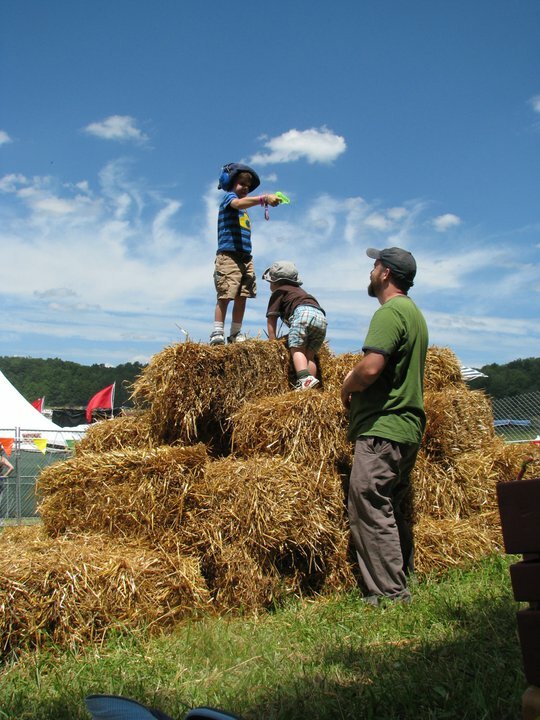 The largest festival we’ve attended so far (with the kids, that is) was the All Good Music Festival, just outside of Masontown, West Virginia. 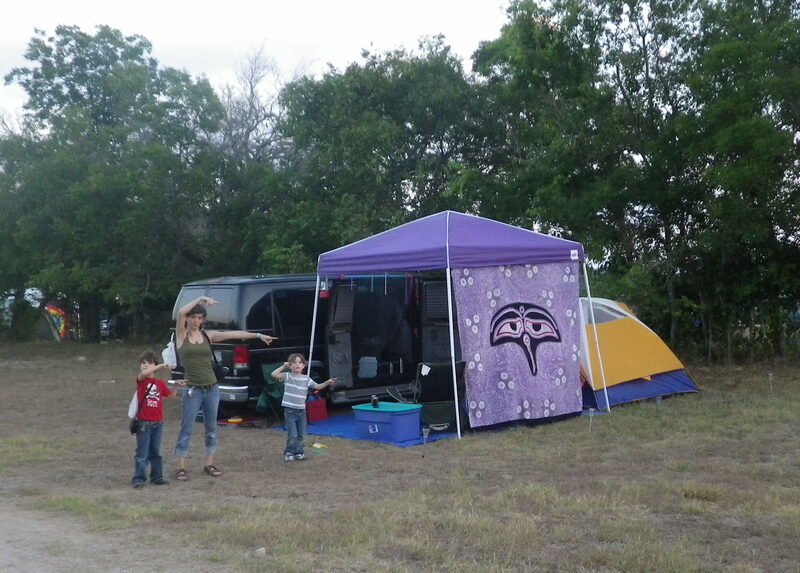 Family camping was fenced off from the surrounding camping areas, nestled between “Sober Camping” and “VIP Camping.” We had special wristbands, and volunteers monitored the family camping gate 24 hours a day to police who was coming in and out. But possibly my favorite feature of the family camping area? Private potable water stations, hand-washing stations, and Porta-potties! This photo was taken from the top of a Ferris Wheel smack in the middle of the festival. 4.) Look for Kids’ Activities. Savvy festival-promoters have started to incorporate these into their scene. Another dedicated space in the campgrounds, and sometimes on the actual concert grounds, with a shade tent or some other protective structure, with volunteers to lead kids’ activities: painting, bead-stringing, board games, a sandbox, ride-on toys for wee ones, children’s entertainers, and maybe even a few comfy chairs for weary parents (or nursing mamas). Be aware, though, these are NOT babysitting services. You have to be present, but it will give you a break from being vigilant, and allow your kids to meet other kid-campers. Kids’ hilltop play area — fence-enclosed, AND in view and earshot of the stage. All Good, 2011. 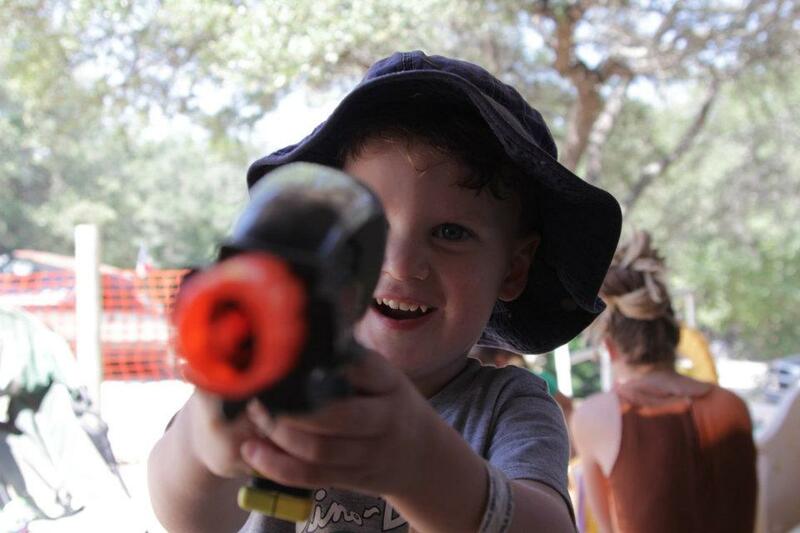 Kerrville’s covered “Kidville” area, during a barn dance 2012. Comfy chair while the kids play in Kidville. Baby J, a-l-m-o-s-t asleep, while his mama marches in the HONK!TX parade! Skincare — Bring plenty of sunscreen, and use it! And wear wide-brimmed hats. And lightweight long sleeves or long pants if you are in full sun, a wooded area, or tall grass. Keep Bugs at Bay — Insect repellents may NOT be your best choice in this instance, unless you have shower access. You don’t want to keep those chemicals on your skin, or breathe them in your enclosed tent all night while you sleep. Instead, I recommend essential oils, or hygiene products like shampoos, deodorants, or body lotions made with essential oils like lemongrass, rosemary, and citronella. You may also want some food-grade (not the swimming pool stuff) diatomaceous earth to deal with unexpected six-legged visitors to your campsite! 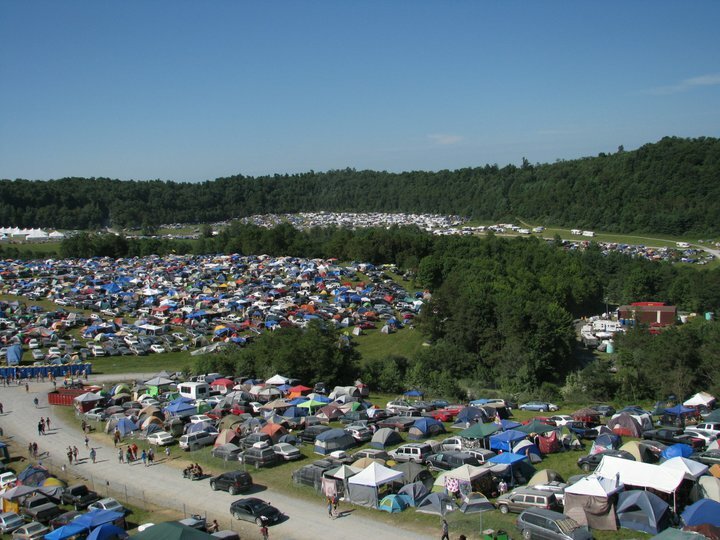 Have an identifiable “Home Base” — Find a good place on the concert grounds from which the stage is visible, but is out of the general crush of the crowd. 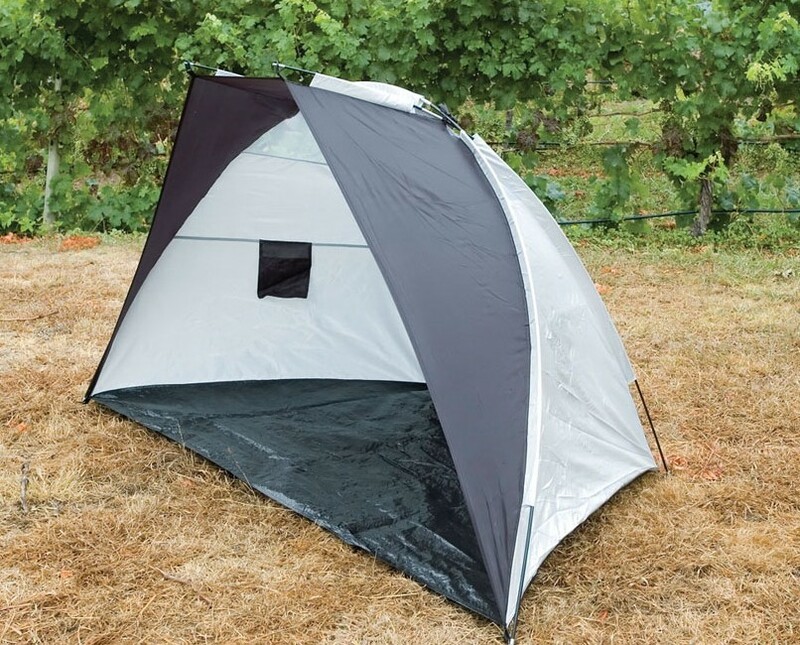 If permitted, set up a little shade tent. Make sure it’s in the same general area each day. Now the kids can roam and play a bit, and come back when they need a snack, a cuddle, or a shade-break. Quick-pitch shade tent. This is what we use for “home base” on the concert grounds. 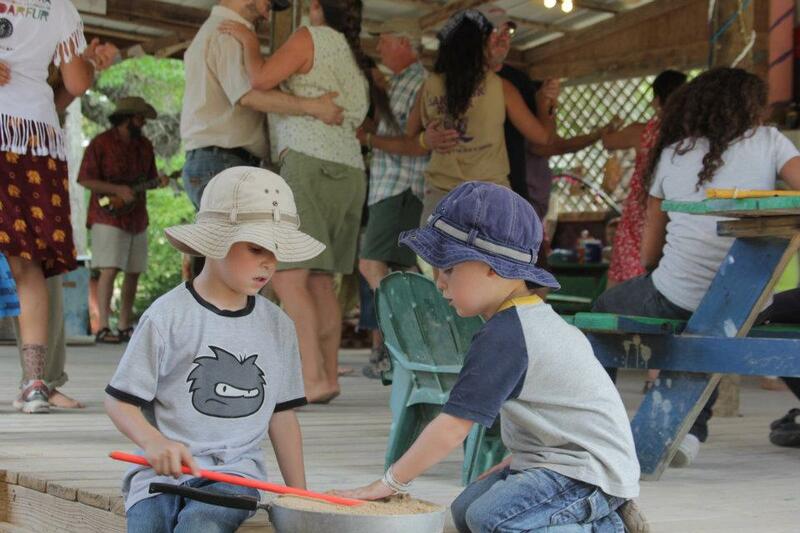 — Find other parents of young children to pitch camp with. Best case scenario, plan trips with friends. If you have tired little ones, you and your parenting partner can switch off nights staying out late to the concerts, and returning to camp early for night-night time. In other words, dads can go see Band X one night while moms have a cup of wine at the campsite, and the following night you switch off so the moms can see Band Y, or you trade “campsitting” nights to pair off as couples. Failing this arrangement, see Rule 2. Make new friends! Sure, you won’t ever want to leave your children with strangers, but your kids will have daytime playmates while you get in some R&R. And make some new friends of your own! Camp Good Tarp Layer, Kerrville 2013. This entry was posted in Music Festivals and tagged 2015, bluegrass, family-friendly, Gayle Ross, Kerrville, Kerrville Folk Festival, music, music festivals, music festivals with young children, Peter Yarrow, Trout Fishing in America. Bookmark the permalink.